Before you try any of these solutions to remove dog tear stains, please read my series of articles about the major causes of Maltese eye stain to better understand the source of the problem. Once you know what is causing your Maltese dog tear stain problem, it will be easier to find the perfect solution. Have you have eliminated Heath, Environment, Water & Diet, or Genetic issues as the cause of your dog tear stains? If so, then read on to discover ways to remove those unsightly tear stains from your Maltese and bring out her beautiful white face. 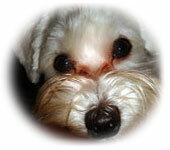 How did you remove your Maltese dog's tear stains? Tell us about it. 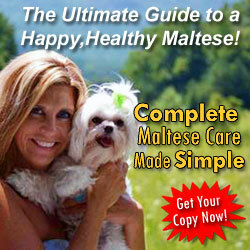 There are many ways to naturally reduce or eliminate Maltese eye stain. Below are the available natural solutions to dog tear staining. This is an all natural powder that you mix into you dog's food. It works especially well for a dog with allergies which may be causing excessive tear staining. Since Missing Link is an Omega 3 fatty acid supplement, it's also good for Maltese nutrition. 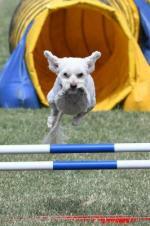 Most dog owners report seeing results anywhere from 1 week to 1 month. Some tear staining may be caused by an ear infection. Pet Alive Ear Dr. is a natural herbal remedy that clears up dog ear infections without any of the adverse side-effects most antibiotics have. Try this solution first if you think your Maltese may have an ear infection. 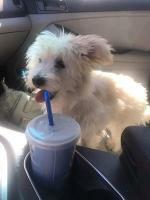 A teaspoon of apple cider vinegar can be added to your Maltese dog's drinking water to control new tear stains. Since vinegar is not the most pleasant tasting, it may take a while for your Maltese to warm up to the idea of actually drinking it. To make the change easier, start with a little less and gradually increase the amount of vinegar in her water. Apple cider vinegar works by changing the pH of the drinking water which makes it a hostile environment for yeast and bacteria. This is a herbal topical treatment that you wipe under your dog's eyes. It's all natural and contains Eyebright, Dandelion, and German Chamomile. These herbs work by reducing eye inflammation, preventing infection and fungal overgrowth, and soothing the eyes. This works well for Maltese that have excessive tearing or are allergic to things in their environment. This product uses two herbal solutions to remove dog tear stains and reduce future tear staining. You use the Eyebright solution to wipe away tear stains, much like PetAlive iClenz. Then you use the Goldenseal solution as eye drops to fight against germs that create eye stain in the first place. 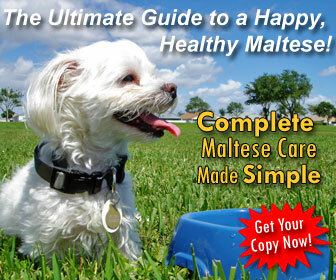 Great for Maltese that have excess tearing or environmental allergies.